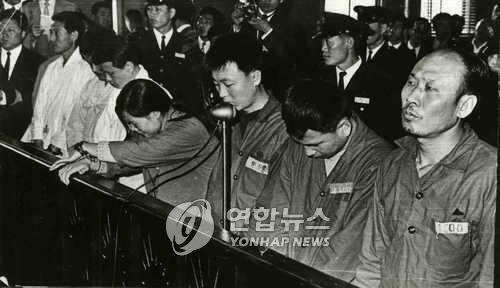 SEOUL, Oct. 11 (Yonhap) -- An ill-fated North Korean defector, who was executed 49 years ago for violating the Anticommunist Law after being wrongly labeled a spy for the North, was declared not guilty in a retrial on Thursday. The Seoul Central District Court ruled that Lee Su-kun, who defected to South Korea in 1967 and was sentenced to death on charges of spying for North Korea two years later, was a victim of false espionage charges fabricated by the predecessor of the National Intelligence Service. At the time of his defection in March 1967, Lee, who served as vice president of the North's Korean Central News Agency, gained fame for dashing into the South at the border peace village of Panmunjom in a hail bullets. But he was arrested in Vietnam by South Korean agents in January 1969 while heading for Cambodia via Hong Kong with a fake passport. Lee was then charged with disguising himself as a defector to collect military intelligence for the North and attempting to escape the South. He was sentenced to death in May 1969, and his execution was carried out two months later. In 2007, the state-funded Truth and Reconciliation Commission announced that Lee had been illegally arrested and tortured and there was no reason to believe Lee's defection was fake. In a retrial held at the request of prosecutors, the Seoul court also said that Lee had been illegally detained without a warrant and there was a good chance that investigators forced a false confession from him. The court acquitted Lee of the charges of violating the Anticommunist Law and the National Security Law. Instead, it sentenced Lee to a two-year jail term for forging government documents and violating the Foreign Exchange Transactions Act. "It seems that Lee sought to leave for a neutral country and live comfortably as he was suspected as a North Korean spy in the South. He didn't appear to have left South Korea to receive secret instructions from the North," the Seoul court said in its retrial ruling. "At the time of his arrest, Lee didn't possess any meaningful state secrets. Furthermore, he could have entered North Korea's consulate in Hong Kong after his arrival there, instead of heading for Cambodia."